The Italian region of Piemonte (Piedmont), with its beautiful mountains and nearby famous lakes (Lago Maggiore, Lago d'Orta), is a haven for a relaxing holiday (vakantie) with wonderful views and walks. We know the region well and can help on where to stay, eat and visit, so you enjoy your vacation to the full. 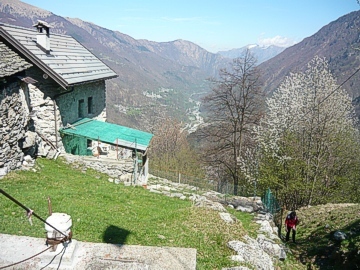 Our web site shows some of the beauty of Piemonte and in particular the Ossola valleys of Anzasca (Valle Anzasca) and Antrona (Valle d'Antrona) in the Verbano-Cusio-Ossola Province, which has become a favourite destination of Italians escaping the heat of the northern cities in the summer, or for skiing at the resort of Macugnaga (Monte Rosa) in the winter. It has also notably become very popular in recent years with visitors from the Netherlands, who are made to feel most welcome. This web site has been put together by an English/Italian family. Between us we have a house and two apartments near Bannio/Anzino in the Anzasca Valley, where we have spent many holidays for well over 30 years. This is a peaceful and beautiful part of the world. The main town of Macugnaga at the foot of Monte Rosa is the main destination for holidaymakers in winter and summer, but the smaller villages are a joy to visit, and the mountain air and scenery is almost guaranteed to completely relieve you of the stress and strain of everyday life. All the pictures on our web site are from our own collection, of the Anzasca and neighbouring Antrona valleys. Walking the mountain roads and paths around Bannio/Anzino, including the road up to Alpe Soi and its now quite famous little restaurant, 'Ristoro Alpe Soi', is wonderful just about any time in the spring and through to late summer, and even beyond if the weather holds. We have a section detailing a series of walks, mostly around the area close to Fontane and Bannio, with photos to help you find your way and entice you to try them. There are also a few walks a little further afield, such as the route across the glacier and up to 'Rifugio Zamboni e Zappa' above Macugnaga. You'll find some wonderful walks in the mountains of Piemonte here. 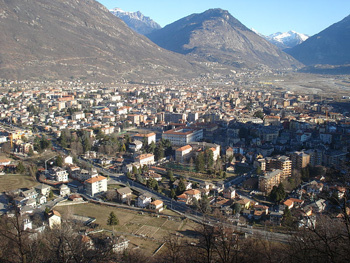 The largest town nearby is Domodossola, situated in the middle of the Ossola valleys. A street market is held every Saturday here during the summer months and attracts lots of visitors. Stresa and Lago Maggiore are less than an hour’s drive away. The nearest airport is Milan Malpensa, with Valle Anzasca little more than an hour's drive. Hiring a car is probably a must for most visitors, but there is a coach service from Malpensa airport to Domodossola. From there, local coaches serve the smaller towns. It is also an area that can be reached from the north - Switzerland and Germany - and from France to the west, by car via various mountain passes (in the summer) and road and rail tunnels. The Simplon Pass brings you close to Domodossola and Valle Anzasca and is a wonderful drive in the summer months (if a little tough on the vehicle!). In recent years the Anzasca valley has become popular with Dutch visitors in particular, but this remains a largely unspoilt part of Italy - indeed, it’s perhaps for that reason that visitors who take time to search it out return home feeling refreshed and rewarded.